These past few weekends have been filled with celebrations, grill-outs, moving, and nights exploring all that Des Moines has to offer. With that comes eating out and many decadent meals. A fresh salad packed with a ton of flavor is exactly what I have needed and this one doesn’t disappoint. Avocado, edamame, and toasted pistachios offer a trio of textures while fresh mint brightens the combination of arugula and salad greens. A simple vinaigrette is all this salad needs and citrusy grapefruit juice is the perfect starting point. Honey adds a touch of sweetness while cardamom brings a slight warmth to the vinaigrette. This salad makes for a perfect appetizer or side salad, but topped with grilled chicken or tofu and this would be a fantastic weeknight entrée. Here’s to hot weather and cold meals! Whisk together grapefruit juice, oil, vinegar, honey, cardamom, salt, and pepper. 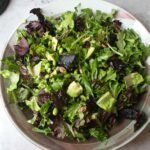 Toss together mesclun, arugula, avocado, scallions, edamame, pistachios, and mint in a large bowl with vinaigrette.